At a meeting with one of our construction finance partners recently, they spoke of their ability to provide finance against JCT contracts (the Joint Contracts Tribunal produce standard forms of contract for the construction industry, that can be modified in some cases). It struck me how far the industry has come since I started in factoring back in 1988. Anything contractual was a "no no" back then, and the construction sector was considered an area where invoice financiers feared to venture. The issue with the sector was always the potential for the value of transactions to be reduced by damages for non-completion of future contracted works, as construction often involves numerous stages / phases of activity. As they can take so long to complete an entire project, most subcontractors will raise interim, staged invoices (or applications for payment) before all the work is completed. So this led invoice financiers to fear that, in a failure situation, they might not be able to collect out the money advanced, from the customer. This coupled with long payment delays led to the sector being ignored for many years. 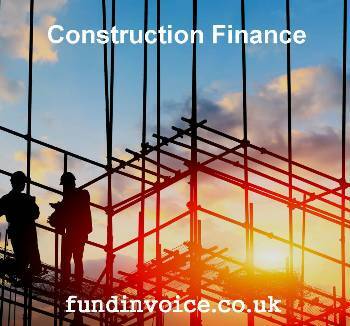 Not so now, everything has changed, with a number of providers actively moving into financing construction companies and setting themselves up as specialists within the sector. They use Quantity Surveyors to go through these contracts and they make informed judgements about how much finance they can put out against them, on the back of the QS's advice. Financing against applications for payment (used by 75% of the industry), even uncertified ones, has become more common, and suddenly the building industry has become fair game for several of the financiers. Funding levels are often used to control the risk in such situations. Normally the maximum prepayment level will be 70%, which is low when you consider some, more straightforward sectors, such as crash repairs and staff recruitment are often funded at 90-100%. However, even lower levels of prepayment can still be a significant cash flow advantage, paticularly where that level of prepayment will contribute towards paying the cost of workers and materials. The strength of our industry has always been it's ability to look at a book debt in details and value that receivable, overcoming any potential issues, in order to fund wherever possible. So I suppose it is no surprise that the same approach has been taken to financing the construction sector.